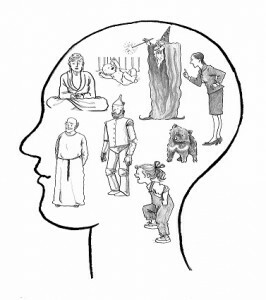 The concept of parts in IFS corresponds to ideas from other forms of psychotherapy—for example, defenses, psychic forces, self-images, introjects, and schemas. However, these concepts are normally seen as just mechanical or biological descriptions of how the psyche operates. Parts, or subpersonalities, may operate in similar ways, but they are alive and personal. They do what they do for reasons of their own, and they have relationships with you and with each other. For example, suppose you are using the defense of repression, which makes a certain memory unconscious. IFS recognizes that a protective part is purposely excluding that memory from your awareness for a reason. Perhaps it is afraid that the memory would cause you to be overwhelmed by pain. Parts are entities of their own, with their own feelings, beliefs, motivations, and memories. It is especially important to understand that parts have motivations for everything they do. Nothing is just done out of habit. Nothing is just a pattern of thinking or behavior you learned. Everything (except for purely physiological reactions) is done by a part for a reason, even though that reason may be unconscious. For example, if you get distracted at a certain point while exploring yourself in therapy, this is probably not an accident. A part wants to distract you because it is seeking to avoid something. Understanding the psyche in this way gives you a great deal of power to change your inner world for the better. Since parts are like little people inside you, you can make contact with them, get to know them, negotiate with them, encourage them to trust you, help them communicate with each other, and give them what they need to heal. When you do, you will have an enormously increased capacity for understanding and transforming your psyche—for achieving wholeness. You may treat the idea of subpersonalities as simply a useful metaphor for viewing the psyche, which it is, but it is much more than that. If you treat the components of your psyche as real entities that you can interact with, they will respond to you in that way, which gives you tremendous power for transformation. Are they actually real? I believe so, but I invite you to read this book, do the exercises, and make up your own mind. IFS is the latest in a long line of therapy methods that work with subpersonalities. Early methods were Jungian analysis, Psychosynthesis, Transactional Analysis, and Gestalt therapy. More recent approaches are hypnotherapy, inner child work, Voice Dialogue, Ego State Therapy, John Rowan’s work, and others. IFS is the latest and most sophisticated of these methods. And many forms of therapy that don’t explicitly work with subpersonalities nevertheless use concepts that are quite similar, such as “schemas” in Cognitive-Behavioral Therapy. IFS represents an advance over these other methods in a number of ways. It recognizes the power and importance of the Self and bases the therapy on relating to your parts from Self. The IFS method takes you deep inside yourself while still remaining alert and in charge during a session. It doesn’t just work with parts in isolation; it has a sophisticated understanding of the relationships between parts that guides the therapy method. As you will see, the most important relationship is between those parts that protect us from pain and those child parts that are in pain. The problems that occur within the human psyche are largely structured around the need to protect ourselves from pain. Since the IFS approach is organized around this, we can have respectful sensitivity to our pain and defenses while pinpointing our work with laser-like efficiency. 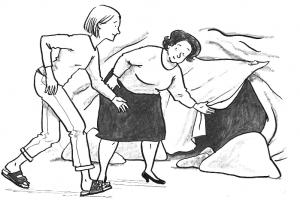 Sharon tended to avoid bringing up difficulties with her friends, but then she would withdraw from them because her negative feelings festered. This was directly tied to her fear of vulnerability. As long as she was holding back negative feelings toward someone, she didn’t have to reach out or get in touch with her vulnerable exile. She felt justified in keeping the person at a distance or even writing them off. She was also afraid of the person’s reactions if she confronted them. “I had a part with the attitude of ‘I’m in the in-crowd and I’ve got something that you don’t. You can’t come in.’ This protector felt this way toward some people. They had to prove that they were willing to be open and loving, that they were scared and vulnerable, and they had to appreciate me and let me know that. Once they did that, then I could trust them. I was very scared to confront Patti, especially because it was something that was part of her character and couldn’t be changed. I lead four Interactive/IFS Groups, some of which have openings now. Click here for more information about them. When working with childhood wounds, there are two dangers. One is that you will be flooded with pain; the other is that you will avoid the exile because you are afraid of the pain being too excruciating. Exiles want to be heard and healed, but they usually try to be heard by flooding you with their feelings, which means blending with you. This is all they know. Blending can be frightening because it draws you into the exile’s vortex of helplessness, and you might become increasingly buried in the pain or chaos. The intensity of reliving a trauma in this way could actually be harmful, and, if this begins to happen, protectors will usually react by stepping in and blocking access to the exile. Keeping you from this suffering has been their job for years, so they will react automatically. You will find yourself going numb or spacing out; you might become distracted or angry. These and other reactions all come from protectors that are afraid of the pain, and for good reason; it really might be difficult for you to cope with. IFS has discovered a way to explore an exile’s pain safely. You stay in Self and relate to the exile; you don’t become the exile. If you merged with the exile and lost contact with the Self, the pain really could be overwhelming. However, the Self, when it is differentiated and separate from the exile, can deal with anything. When in Self, you sit in a calm, grounded place, and therefore you aren’t threatened by pain and trauma. If you start to be overpowered by the exile’s emotions, which means that the part is blending with Self, IFS has effective techniques for unblending and returning you to a grounded place. This approach is workable because, in most cases, it isn’t necessary for you to directly feel all of the exile’s pain. 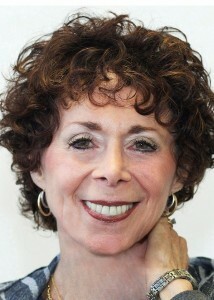 IFS has discovered that emotional understanding is usually enough to set the stage for the rest of the healing steps. There are a number of benefits to this approach. Besides avoiding being re-traumatized, you aren’t confronted with an armory of defenses to keep you from the exile. Since you aren’t threatened by the exile’s pain, protectors don’t feel the need to interrupt the process. This saves time, and sometimes it is the only way to work with an exile because, otherwise, protectors continually throw up obstacles and may permanently block the process. Furthermore, by remaining in Self, you can be a compassionate witness to the exile’s pain and the agent of healing and transformation for the exile. 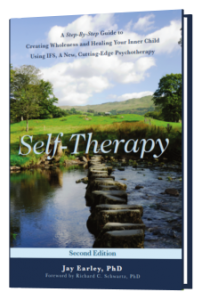 In addition, from Self, you have the perspective to direct your own therapy process successfully. In the Advanced Ongoing IFS Classes, you learn intermediate and advanced techniques and understandings that go beyond what I teach in the Basic and Exiles Courses. I lead demonstration IFS sessions with volunteers from the class, and you practice with each other in pairs for homework. 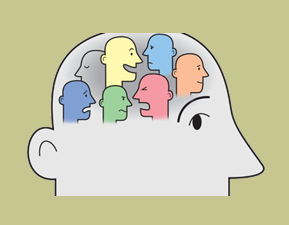 In addition, the whole group works together on important psychological issues such as procrastination, the inner critic, depression, eating issues, and more. There are separate classes for therapists and coaches, which include advanced training and consultation on IFS. Click here for detailed information, schedule, and how to join. In this introduction, I will describe what happens in these classes, what we cover, and answer your questions. Whenever we are being attacked or judged by an Inner Critic part, there is always a second part of us that is receiving this attack and feeling hurt, depressed, or worthless. We call this part the Criticized Child. This is an exile who believes the attack and feels ashamed or guilty, bad, or inadequate. Many people, at first, don’t make a distinction between the Critic and the Criticized Child, but doing so is crucial to unraveling this difficult issue. There are always two parts involved. One part attacks us, and a second part feels attacked. For example, suppose your Critic sneers at you and tells you that you’re so shy that you’re a loser and no one likes you. The sneering Critic feels harsh, judgmental, and dismissive toward you. There is a second part of you (the Criticized Child) that believes this attack and feels rejected, ashamed, and worthless. You will need to work with both parts, but in very different ways. If you haven’t already, you can take a quiz to learn which Inner Critic is more trouble for you. In a 9 week on-line course learn how to Transform Your Inner Critic using IFS and Self-Therapy Journey. One of the most startling discoveries about our Inner Critics is that they are actually trying to help us. This is an amazing, powerful secret learned from IFS. In its own distorted, confused way, your Inner Critic is actually trying to help you. At first this may seem surprising, but once you get to know your Critic in a deeper way, you’ll come to understand why it is attacking you. It may be negative and harsh, but it is doing so in a distorted attempt to protect you from pain. As strange as it may seem, we have found this to be true over and over with hundreds of clients, and so have other IFS therapists. 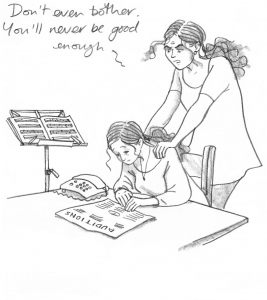 Your Inner Critic may think that pushing and judging you will protect you from hurt and pain. It may believe that if it can get you to be a certain way—perfect, successful, cautious, nice, slim, outgoing, intellectual, macho, and so on—then you won’t be shamed or rejected, and you might even get approval from people who are important to you. It may try to get you to fit in by prescribing rules and then attacking you if you violate them. Even though attacking you actually backfires and causes you more suffering, your Inner Critic is doing what it thinks is best for you. The good news is that because the Inner Critic actually has positive intentions, you don’t have to fight with it or overcome it. You don’t have to win a battle; you don’t have to get rid of it. Instead, using IFS, you can discover what it thinks it’s doing for you and make a positive connection with it. You can offer it appreciation for its efforts, and it can begin to trust you. Knowing that your Critic’s heart is in the right place makes it possible to create a cooperative relationship with it and transform it into a valuable resource. This relationship makes an enormous difference in your internal landscape and sets the stage for deeper healing. 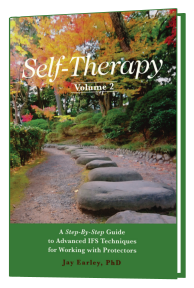 Self-Therapy, Vol 2 devotes an entire chapter to Self-like Parts which describes each of these types in detail. Some parts think they are the Self. This means that when you are blended with such a part, you think you are in Self, and you don’t recognize the limitations of the part you are blended with. These parts are called “Self-like” not because they necessarily have more of the qualities of Self, such as compassion or connectedness, but instead because they appear to be the Self. If you are blended with a Self-like Parts and don’t realize this, your IFS work will run into trouble. You will get stuck in a variety of ways or your work will be flat and not very healing. So it is crucial to be able to recognize these parts and unblend from them. There may be others. Be on the lookout for one of these parts because it can sabotage your IFS process. 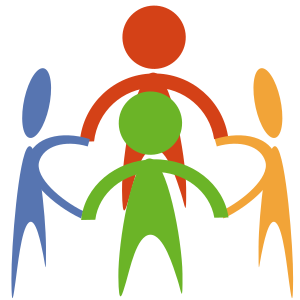 This group provides an opportunity to learn what an Interactive Group is like by participating in one. It is also a chance to explore how you relate to people you are just meeting. What do you go through emotionally when you are meeting new people? Most of us feel some nervousness and also some excitement. There are a variety of ways that people deal with this. Some people hang back and say very little. Some tell entertaining stories so they will be liked. Others act friendly and caring to make other people feel comfortable. Almost all of us try to hide our discomfort. I facilitate the group, helping you to tune into what you are experiencing and speak your truth. You may tell others honestly and directly how you are feeling toward them. We create an atmosphere of caring and trust so that this can be done in a safe, connected way. You also have a chance to get honest feedback from people on how they are responding to you.